Indian Army Notification is out. Indian Army is recruiting for 100+(Not Specified) Rally Online Form Posts. You can check Indian Army - Indian Army last date, download Indian Army notification, visit Indian Army official website and check other Indian Army Vacancy details.Complete Vacancy and recruitment Details about 100+(Not Specified) Rally Online Form vacancies in Indian Army are provided below by JobSarkari.Com only for you. Date of Admit Card. 20/05/2019. Date of Rally. 07/06/2019 to 17/06/2019. Soldier Technical. Candidate Must Have Passed Class 12th in Science With Physics, Chemistry, Maths And English With 40% Marks in Each Subject And 50% Marks in Aggregate. 17 ½ to 23 Years. 165. 50. 77-82. Soldier Technical (Aviation/ Ammunition Examiner). Candidate Must Have Passed Class 12th in Science with Physics, Chemistry, Maths and English with 40% marks in each Subject and 50% Marks in Overall Aggregate. 17 ½ to 23 Years. 165. 50. 77-82. Soldier Nursing Assistant. Candidate Must Have Passed Class 12th in Science with Physics, Chemistry, Biology and English with 40% marks in each subject and 50% Marks in Overall Aggregate. 17 ½ to 23 Years. 165. 50. 77-82. Soldier General Duty. Candidate Must Have Passed Class 10th With Minimum 33% marks in each subject with Overall Aggregate of 45% As Mentioned in Notification. 17 ½ to 21 Years. 166. 50. 77-82. Soldier Tradesman. Candidate Must Have passed Class 10th And having 33% marks in Each Subject. Candidate Must Have Passed Class 8th And Having 33% in Each Subject. 17 ½ to 23 Years. 166. 48. 77-81. Soldier Clerk/ Store Keeper Technical. Candidate Must Have Passed Class 12th With 50% Marks in Each Subject And 60% marks in Aggregate As Mentioned in Notification. 17 ½ to 23 Years. 162. 50. 77-82. 1.6 Km. Group-I - 05 Minutes 30 Seconds. 1. Candidate Can Apply Through Online/ Offline Mode. 6. After Successful Registration Candidate can Log In with Registration No. And Password. 8. Online Application Can be Submitted on or Before 18th May 2019. 9. Candidate Can Go on Given Address For Rally on 07th June 2019 to 17th June 2019. Q. 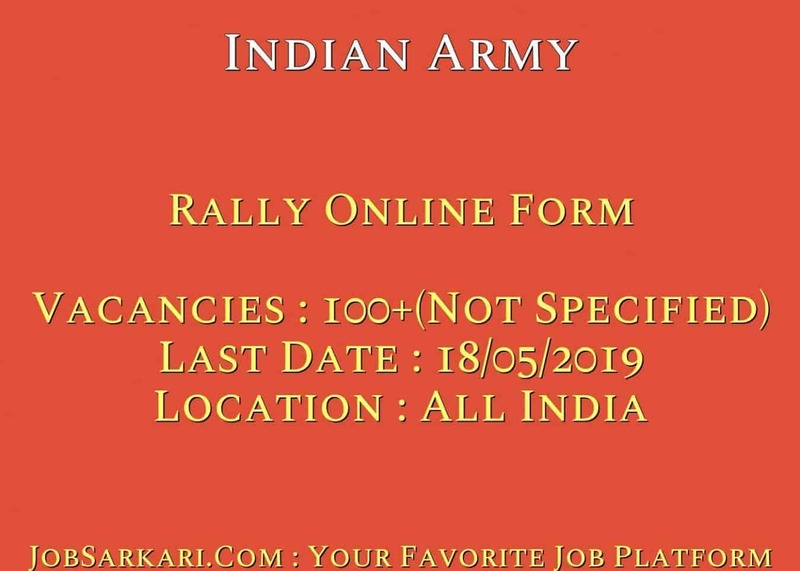 What is the Last Date For Indian Army Rally Online Form Vacancy ? A. 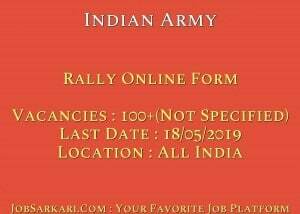 Last Date for Indian Army Rally Online Form Posts is 18/05/2019. Q. What is the Form Type of Indian Army Rally Online Form Recruitment ? A. The Form Type for Indian Army Rally Online Form Posts is Offline, Online. Q. How many vacancies are available in Indian Army Rally Online Form Posts ? A. There are about 0 Vacancies in Indian Army Rally Online Form Posts. Han Aap is Post ke Liye Apply Kr Sakte Hain Lekin aapko Rally Jha Hogi Vaha Jana Hoga. Han aap is post ke liye apply kr sakte hain.